Am I really Pentecostal? I’m thinking of this in several ways because recently I have been attacked by some for (1) being too Pentecostal, and by others for (2) not being Pentecostal enough. So which is it? Or is neither accusation correct? Maybe I’m the perfect Pentecostal (whatever that might look like 🙂 ). What does it even mean to be “Pentecostal”? Does it just mean I speak in tongues? That would be a pretty lame interpretation that would leave aside the entire Pentecostal conceptualization of the Gospel message (Jesus is Savior/Sanctifier, Baptizer, Healer, and Soon Coming King) or ethos (empowered participants of the life of the Spirit). 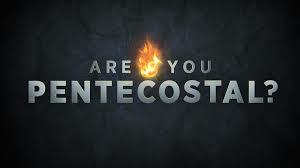 Can I be “Pentecostal” and not speak in tongues? Think William Seymour as he began his ministry. Can I speak in tongues and still not be “Pentecostal”? Think Church of Jesus Christ of Latter Day Saints. Does it really hinge on tongues? Should it? Is it to be a person of the Spirit (whatever that means)? Or is that too individualistic and to generally broad? Is it to be a vibrant member of the people of the Spirit? Or is that broader still even while encompassing the wider movement of God’s presence and work in the world? And shouldn’t I already have all this figured out because I’m not only a self-describing “Pentecostal”, but even a pastor of a “Pentecostal” Fellowship (and among the regional leadership of said wider Fellowship)? Worse still, I’m a “Pentecostal” scholar working on a PhD in Pentecostal Studies. But does that mean I happen to be a Pentecostal who is a scholar or that I am a scholar of things Pentecostal? And does that mean I really have it figured out? One would really think a person like myself should have a lot more answers. The problem is that with every answer, I find more questions begging to be answered. So what kind of Pentecostal am I anyways? I would like to think I am the kind that loves the Lord my God with all my heart, mind, soul, and strength, and loves my neighbor as myself. I would like to think I am the kind that does this in the vivifying power of the Spirit, the Lord and Giver of Life, who was sent by the Father, who is the Spirit of Christ Jesus. Oh, and I also speak in tongues. Author Rick WadholmPosted on May 8, 2013 Categories PentecostalTags Christ Jesus, Glossolalia, Pentecost, Pentecostalism, Theology, Tongues14 Comments on Am I Really Pentecostal?